I think figs may be one of the most unappreciated fruits. I know that I didn’t always see the beauty in them. Typically I thought of them in their dried form, which doesn’t showcase them nearly as well. While Fig Newtons may be enjoyed by many, they are near the bottom of the list of cookies I would like to eat. However, through a few dining experiences, I was able to sample figs in their fresh form. Served atop salads and integrated into other dishes, I enjoyed the taste and texture of these fruits. With a new perspective on them, I decided to try them as is while on vacation in Paris. That was the moment that had me hooked. Unless you have tried a perfectly ripe fig, so tender you can scoop the pulp out of its skin, you really haven’t tried figs. My husband and I now look for figs, both in our restaurant travels and at farm stands when the restaurant is available locally. In the last few weeks, figs have been ripe for harvesting, and we have been purchasing them. When we purchased a handful of them the other week, I decided to use them as part of our Tapas Monday menu. Although these fruits are delicious on their own, I decided to try something new. The result was a dessert so fabulous that I wished we had more figs and I had a bigger appetite. The other beautiful thing about this recipe was the simplicity of it. Little effort is required to make this dessert that is appealing to the eyes and the mouth. In a small bowl, combine goat cheese and honey, stirring well to incorporate fully. Cut figs in half through the stem. Place figs skin side down on a baking sheet. 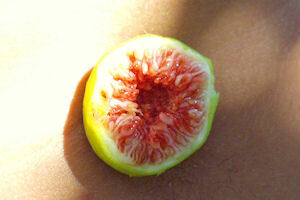 Remove from oven, and make a small indent in the center of each fig half. Spoon a small amount of goat cheese/honey mixture into indent. *I used pecans only, but walnuts or almonds would be fine also.